After long rumours, mini launches and confirmations, “Facebook Messenger Unsend option” is finally here. Many people would be relieved to know about it especially those people who had sent “I love you X” text to Y, and ended up in fights due to this. Previously WhatsApp had relieved its customers by introducing the same feature and later on increasing the time to delete or unsend the message you have sent accidentally. 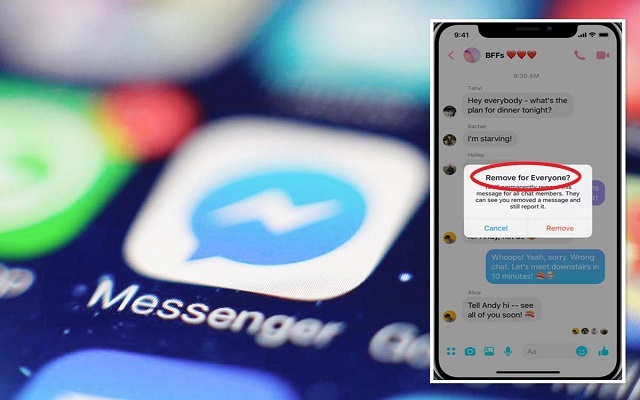 So in the case now you have sent a wrong message to the wrong person or wrote some abusive language when angry, can be undone with Facebook messenger Unsend feature in Facebook Messenger Latest Update. You can delete any message by tapping on the specific message within 10 minutes of sending it. Upon clicking on the message, two option will appear: Remove for Everyone and Remove for You. By selecting remove for everyone. Your text message will be replaced with” “message has been removed by you. This new Feature is made available to everyone yesterday on Messenger for iOS and Android. This Unsend option on Facebook messenger was long in rumours and was also rolled at a point for higher officials. Bolivia, Colombia, Lithuania, and Poland were the first countries to get this new feature. However, in the other parts of the world, now it is rolled out for everyone. So what are you waiting for? Update Facebook Messenger and enjoy this feature.